Edward Ellison teaching a men’s variation class. Photo by Rachel Neville. Ellison Ballet presents a mixed rep bill at Symphony Space (96th and Broadway) on May 15 and 16. 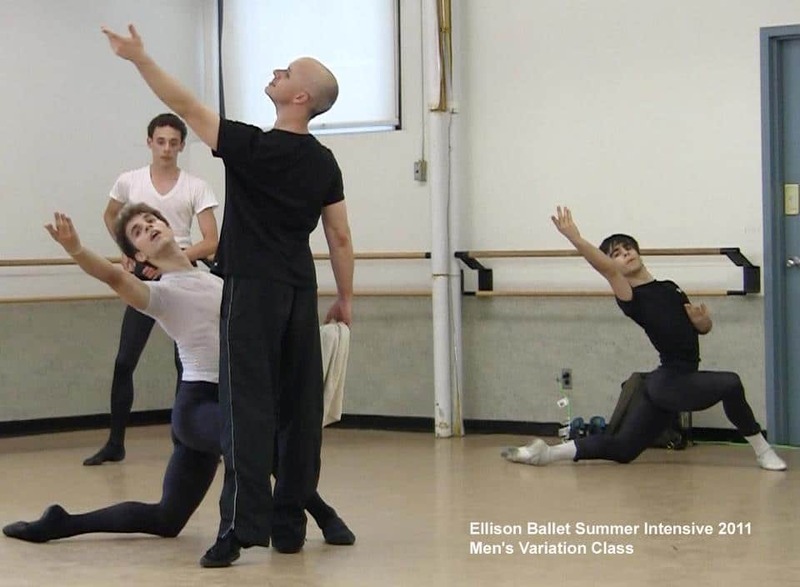 Ellison Ballet is a training school in New York City run by Edward Ellison, a former Soloist at San Francisco Ballet. The performance, which commemorates the 10th year of the school, consists of one-act ballet Carmen, as well as excerpts from Petipa’s Don Quixote and Esmeralda, Vainonen’s Flames of Paris, Gzovsky’s Grand Pas Classique, Legat’s Fairy Doll and Bournonville’s Jockey Dance, to name a few; all of which will be performed by both current students and alums of Ellison Ballet who are currently dancing with companies around the world. I enjoy performances from student companies and look forward to the diverse rep Ellison offers. Ballet fans that only attend major companies like ABT and NYCB don’t know what they are missing. Student companies like Ellison’s offer exciting performances that sometimes rival the established companies as dancers are turned loose to showcase their talent. I interviewed Edward on the upcoming performance, teaching philosophy, and plans for the future. Balletfocus: The performance in May includes Carmen. What can you tell us about the production? Edward: My production of Carmen debuted in 2006, performed by the Rochester City Ballet. I have always adored the opera Carmen, and it’s music by Georges Bizet, one of the greatest masterpieces of classical music, has always inspired me greatly. The story is rich with sensuality, seduction, violence, and is simply perfect for dramatic ballet. You could say I unintentionally work-shopped Carmen for several years prior to creating the whole ballet, beginning with a Carmen solo, which then led to creating a pas de deux and group scenes as the years progressed. I set these pieces in Mexico in 2003 and the company there invited me to choreograph a one-act Carmen ballet the following year. This project fell through due to financial difficulties, but gave me the incentive to assemble everything I needed musically and dramatically to choreograph it. Upon guest teaching in Rochester NY in 2005, I presented my ideas to the artistic director of Rochester City Ballet, Jamey Leverett, and she invited me to create the ballet on her company. They performed it wonderfully and it was met with standing ovations and critical acclaim. Balletfocus: In the 10th anniversary performance, graduates of your school will perform. Any detail on the dancers and where they are currently? Edward: We are still organizing who among Ellison Ballet alumni will be able to perform, as most are in ballet companies who are still in season in May and therefore can’t come, but we will have some surprise guest artists… Stay tuned! Balletfocus: You mention your students in ballet competitions on your website. How important are the competitions to your students and school? Are there any students performing in May that are currently in competitions or have completed competitions? Edward: Ballet competitions, when approached in the right way, are very beneficial to our students and Ellison Ballet. The training process is quite intense, and can really help to elevate a student’s technical and artistic abilities, as well as give them valuable exposure to artistic directors of professional companies. I’ve had a number of students receive contracts after being seen in competition. Competitions have helped give Ellison Ballet exposure as well, and have attracted many other talented young dancers to audition to study at EB. – 1st place: “Danse Boheme” Ensemble category (Chor. by E. Ellison). – 1st place: Juliette Bosco – Junior Women category. – 2nd place: Juliette Bosco & Theophilus Pilette – Pas de Deux category. – Professional Contract: Melissa Chapski – Het Nationale Ballet Second Company & Dresden SemperOper Ballet Apprenticeship. – Martina Prefontaine: Berlin State Ballet School, Princess Grace Academy, Australian Ballet. – Juliette Bosco: Royal Ballet School, Princess Grace Academy, Orlando Ballet School. – Theophilus Pilette: John Cranko School (Stuttgart). – August Generalli: John Cranko School (Stuttgart). It was also an extraordinary experience to have two of the pieces, mentioned above, selected to perform at the YAGP Gala – “Stars of Today Meet the Stars of Tomorrow” at Lincoln Center. The Grand Pas Classique Pas de Deux with Juliette Bosco and Theophilus Pilette and an excerpt from Carmen which you see in its entirety at our May performances. Balletfocus: How many students do you have? How many classes do they generally take per day/hours of ballet training per day? How about in the summer intensive sessions? Edward: The Ellison Ballet – Professional Training Program is a relatively small school, with just 3 levels of students (Advanced ladies 16-19 yrs, Intermediate ladies 12-15 yrs, and Men’s Class (15-20 yrs) comprising of 36 pupils, averaging 12 students per class. By maintaining a small student-body, we are able to offer excellent individual attention and a full day of training from 10:30am to 4:30pm, as well as additional hours of coaching. They study classical technique, pointe, variations/repertoire, pas de deux, and body conditioning. The Ellison Ballet Summer Intensive is significantly larger, and we will have approximately 150 students this coming summer. Balletfocus: Your students train from 10:30 a.m. to 4:30 p.m. How do the students integrate ballet training with formal education? Edward: All Ellison Ballet-PTP year-round students complete their academic education through various national online schools, some of which are connected to major universities such as Stanford University and George Washington University. Balletfocus: You have auditions in a number of cities in the U.S. What are you looking for in dancers for your school? Edward: Each winter we have a national audition tour in approximately 18 cities. We have also held auditions in Europe and we’re working on an annual Japan audition for the near future. I look for students who have excellent proportions, a natural sense of movement, musicality, unique expressiveness, intelligence, and a true passion and willingness to work hard to become highly skilled and effective artists. Balletfocus: There’s been a lot of discussion in the dance world about top American companies employing dancers from around the globe, especially those from Russia. Yet, American students from Ellison Ballet are being recruited by top Russian companies. To what do you attribute this? And what does this say about the future of classical ballet? Edward: Ellison Ballet graduates can be seen in many companies across the U.S., Europe and Asia, but we’ve had much interest from companies in Russia and other countries in Eastern Europe as well, where Vaganova education is prevalent. This is due to the purity of classical Russian technique taught at our school, as well as the excellent professional readiness of our graduates. Barriers in the dance world are opening up more and more these days. Although Russian dancers have long been in demand in the West, it is only recently that American trained dancers have been receiving employment in Russia. Perhaps Ellison Ballet is among the pioneers in that regard. Our graduates have received contracts to the Eifman Ballet and a recent offer to the Mikhailovsky Ballet, in St. Petersburg, as well as the State Ballet of Georgia, in Tbilisi, directed by Nina Ananiashvili. During their recent NYC tour at the Koch Theater at Lincoln Center, Mikhailovsky Ballet selected several of our students to perform in Asaf Messerer’s Class Concert, dancing featured parts alongside company stars Natalia Osipova, Ivan Vasiliev and Leonid Safranov , which was a tremendous thrill! Russian TV did a story on two current EB students, Juliette Bosco and Theophilus Pilette, and Mikhailovsky plans to invite them to Russia to perform with the company as guest artists. The former artistic director of the Kirov/Mariinsky Ballet, Oleg Vinogradov, has invited another current EB student, Sara Ezzell, to St. Petersburg this April to perform the title role in the full-length Giselle, and we have been preparing her in detail for this exceptional opportunity. We also have students who have accepted invitations to study at the famed Vaganova Academy in St. Petersburg and the Bolshoi Academy in Moscow. 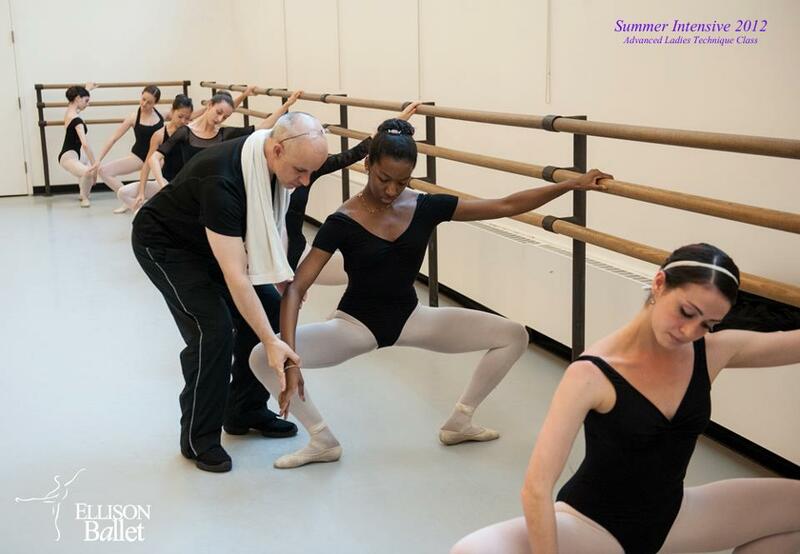 Ellison teaching an advanced ladies class in the 2012 summer intensive. Photo by Rachel Neville. Balletfocus: Can you describe the Vaganova Method of teaching that you use? What is your teaching philosophy? Edward: Vaganova, named after the famous Russian pedagogue Agrippina Vaganova, is a very complete training method of classical ballet, which incorporates the use of the entire body. It is a logical and methodical approach that begins with clear simplicity, gradually increasing in complexity and artistic nuance as the students’ strength and skill increase. There is much emphasis on the development of proper technique, natural coordination, strong yet very elastic muscles, and achieving an acute awareness of ones instrument. Most important to instill in our students is the understanding that ballet is merely a language… an artistic language of the body. To become an effective “speaker” in any language, whether verbal of physical, it is essential to reach for mastery of its rules, but only as a starting point toward developing the freedom to communicate through the language. Dance steps, like text, mean very little if not spoken from the heart. Balletfocus: You specialize in Vaganova education and have been successful in placing your students in Russian companies. Did you have Russian training/teachers or did you train in Russia? What sparked your interest in Vaganova training? Edward: I can’t say that anything initially sparked my interest in Vaganova training. It was simply what life directed me toward, and I sort of just fell into its lap. I didn’t know what Vaganova was back then, nor any other method for that matter. I just knew I was drawn to the passion and excellence of a particular teacher. My own education began (in the U.S.) with an incredible teacher named Marius Zirra, who was from Romania but received his education in Leningrad from the great Alexander Pushkin. Under Zirra’s tutelage, a strong artistic foundation was laid. Although there were some excellent teachers in between, fate put me into the hands of another absolutely brilliant teacher, Larisa Sklyanskaya, during my final two years of training at San Francisco Ballet School. Sklyanskaya had been soloist with the Bolshoi Ballet, and brought a wealth of knowledge and creativity to educating her students. I consider those two years some of the greatest of my life. After joining SFBallet company, I continued studying with Sklyanskaya as much as possible, and studied pedagogy (teacher training) from her as well, which established a solid teaching base for me. I then went to St. Petersburg, Russia to study teacher training at the Vaganova Academy, but I credit Sklyanskaya for truly educating me. I also learned a tremendous amount from an SFB company teacher, Irina Jacobson, who had been a pupil of A. Vaganova herself and was an extraordinary teacher. Balletfocus: Any reflections on the 10th year of the school? Any big changes planned in the future? Edward: Although I was optimistic about creating a wonderful school 10 years ago, I knew very well the great challenges I faced doing it in such an expensive and competitive city as Manhattan. As I reflect back, I feel such gratitude that the school’s success came rather quickly. We attracted excellent talent from the very first year, and it just seemed to snowball from there. I can’t say that there are major changes in store, but I am always evaluating and searching for how to continually make improvements to the school. One thing I want to see a significant improvement in is our ability to offer a greater number of scholarships and financial assistance to our students, and to acquire further financial growth for more studio space.